Hard-hitting ground level action of future NFL Hall of Famers…..the sweaty rigors of summer camp….rousing locker room speeches…half-time pageantry. 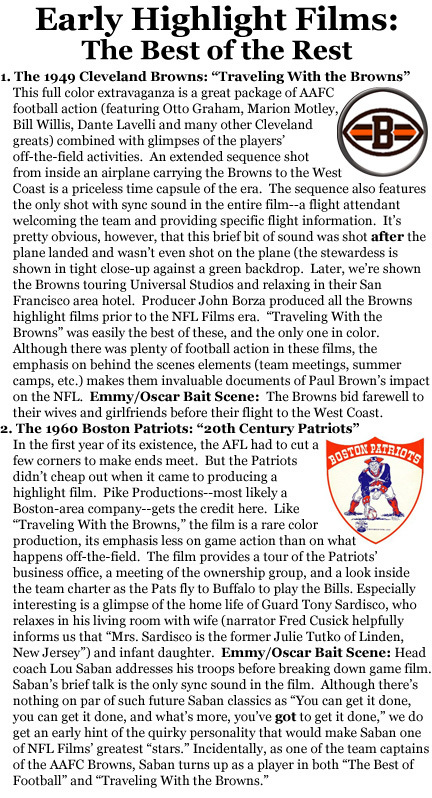 It sounds like a classic NFL Films Production – except that it’s not. In the midst of an identity crisis, The Vault Keeper emerges from the furthest reaches of the film vault with a musty collection of pro football highlights that were produced two decades before the birth of NFL Films. As soon as it appeared likely that the Colts were going to cut Peyton Manning loose, pro football experts were quickly on the scene to inform us that a team cutting or trading the face of its franchise was not without precedent. We were given a little lesson in NFL déjà vu (Joe Montana, Brett Favre and Johnny Unitas ) that provided us with some historical context for Manning’s imminent departure. You don’t have to be a grad student to realize that nothing exists in a vacuum. Before there was man, there was caveman. Before there was rock n’roll, there were the blues. Before there was NCIS: LOS ANGELES, there was NCIS. As an NFL Films producer, I’ve always been curious to know where I came from. Sure, I came from chimps, probably, but I’m not looking to go that far back on the evolutionary scale. No, what I’ve always hungered to learn is the following: who was writing, editing, and directing pro football movies before NFL Films joined the NFL in 1964? The general consensus is that chimps might have been doing this, too. I first uncovered this 30 minute gem back in 2001, when I was researching material for the HBO documentary, “The Game of Their Lives: Pro Football in the 1950’s.” I had pretty much forgotten about it until a recent incident reminded me that I was full sail into my sunset years. What happened was this: I nearly suffered a fender bender at the local mall, and the fetching 20-something female in the other vehicle shouted, “Watch what you’re doing, grampa!” Within 2 minutes of this incident, I found myself contemplating larger existential questions about life, a large chunk of which has included my long, long career at NFL Films (i.e., “Was I born to produce pro football films?” “Why am I here producing pro football films?” “What is the meaning of a life producing pro football films?”). To discover the answers to such vexing queries, I saw that my path was a simple one. I could seek wisdom from an analyst or a spiritual advisor, or I could take another look at the Dons highlight film. I chose the Dons highlight film. First, a little pro football history: The Dons were a charter franchise of the old All-American Football Conference, which mounted a serious challenge to the NFL during the immediate post-war era. The conference almost succeeded, largely because of the innovative and exciting brand of football played by Paul Brown’s Cleveland Browns. The AAFC started with 8 teams in two divisions. Each team played 14 games, and the 14 game schedule was just one of several areas where the AAFC was ahead of the starchier NFL. The upstart conference also broke the color line by featuring the first African-American players to play pro football since 1933. With the Dons and San Francisco 49ers, the AAFC also provided the West Coast with their first professional sports franchises. * Shaky ownership and low attendance plagued most of the teams in the AAFC, which folded in 1949, but 3 of the franchises were absorbed by the NFL – the Browns, 49ers and Baltimore Colts (not the same Colts franchise that won the 1958 Championship in “Sudden Death” and recently parted ways with Peyton Manning). During their four seasons of existence, the Dons were not “the best in football.” They weren’t even the best in the AAFC. They posted a winning record just once and never made the playoffs. But one thing they knew how to do was produce an entertaining little highlight film. This isn’t surprising considering that the team’s star-studded ownership group included Bob Hope, Bing Crosby and MGM studio head Louis B. Mayer. Film and radio actor Don Ameche was Team President, giving the team’s name a double meaning that related to the historical past (Dons were Spanish landowners who helped settle California) and the glamorous present (popular leading man Ameche). The film begins with a series of shots that depict the pre-game hustle and bustle outside the LA Coliseum. We see programs being hawked, ticket booths doing a brisk business and fans walking through the turnstiles. The camera then follows fans into the Coliseum tunnels as they walk to their seats. Aside from its black and white cinematography and absence of live sound, the opening to “The Best in Football” prefigures the opening of “A Spectacle of a Sport,” NFL Films’ Super Bowl I film, which was produced 20 years later. Despite the numerous groaners contained in the script (“Look at that swivel-hipped speedster eat up those chalk stripes”), the narration is actually unique in that it employs second person point of view for most of the film. For example, when there’s a “flash back” from the season-opening kickoff to a busy highway leading to the Dons’ summer camp, the narrator says, “Let’s go back and see how a major league football machine is built. It’s early July on US 101, and let’s imagine you are in that car…you’re from some small out of the way college but hand-picked 8 months ago by some eagle-eyed Dons’ scout.”** Now, I suppose it’s entirely possible that Jay McInerney saw “The Best in Football” before he wrote his 80’s best-seller, Bright Lights, Big City, which is told entirely in the second person, but somehow, I doubt it. In any case, this narrational device was often used in post-war industrial films as a way of getting the audience “into” the film and to have the viewer “identify” with the people on screen. Obviously, it’s a style that requires a leap of faith on the filmmaker’s part – if you weren’t hand-picked by an “eagle-eyed Dons’ scout” – and how many people in 1947 America were, really? – then you might find it hard to buy into the film at this juncture. Unsurprisingly, the Dons’ Hollywood connections are frequently emphasized. The lavish halftime shows depicted in the film also include highlights from youth football games played during the intermission. The teams’ sponsors include Bob Hope, Mickey Rooney and Al Jolson. But it’s Team President Don Ameche who’s the star of this show. Ameche addresses the team at summer camp, and also delivers a post-game locker room speech. In all of his speeches, Ameche stresses that the Dons have a civic duty to make the city of Los Angeles proud, and in the locker room, he tells his men, “While we didn’t win a championship we won a lot of friends.” There’s a sentiment you don’t hear a lot in today’s NFL, that’s for sure. 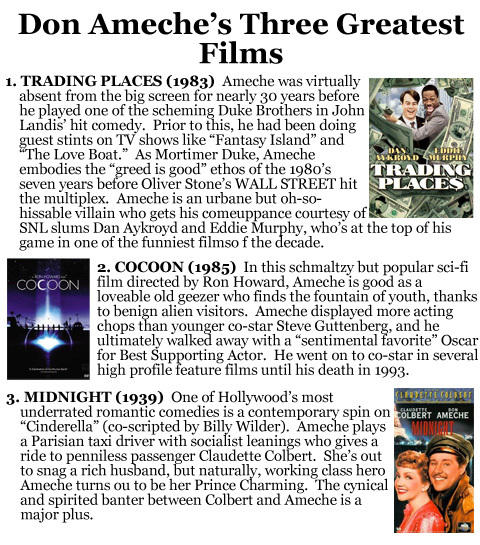 Ameche’s speeches are the film’s only examples of live sound, but the curious thing about them is that the voice delivering these speeches does not belong to Don Ameche. Incredibly, an actor who was known as much for his radio work as his film performances, is post-dubbed by some anonymous actor, or possibly even the Dons’ equipment manager. I doubt there’s any amount of research that could reveal why Ameche’s real voice wasn’t used. I mean, the guy’s on camera and again, the team is called the Dons, fer Pete’s sake. Maybe he didn’t want to strain his voice because he was going to be starring on “Lux Radio Theater” on the two occasions he gave speeches to his team. Maybe the sound crew lost or damaged the recording equipment on the way back to the studio. Maybe it never occurred to the producers to get Ameche into a recording session to post-dub the speeches. Or maybe they did, but when they scheduled a recording session, Ameche was on location somewhere. Or he had the flu. The film’s direction is credited to someone named Shamus Culhane, a name that recalls John Ford movies, Eugene O’Neill plays, and basically any production where leprechauns or IRA assassins play a key role. The script was written by Charles Chaplin. It’s pretty awesome to think that Chaplin, the world’s most famous filmmaker and actor, was killing time between THE GREAT DICTATOR (1941) and MONSIER VERDOUX (1947) by putting his Tramp costume in the closet and devoting his legendary creative genius to the Dons highlight film. Perhaps, you might wonder, did he kick around a few ideas with Buster Keaton? But of course, the Dons’ Charles Chaplin isn’t THE Charles Chaplin. Charles Chaplin the filmmaker had a profound influence on the art of cinema. The Dons’ Charles Chaplin was just a regular schmo named Charles Chaplin (or perhaps it was a clever alias), but at least when I say, “As a producer of football films, I’m a part of the same tradition as Charles Chaplin” I’m not lying.